With profound indignation we denounce the aggression we were subjected to this May Day by the state and municipal police in the service of the rich and the state government. With profound indignation we denounce the aggression we were subjected to this May Day by the state and municipal police in the service of the rich and the state government, under the command of the criminal, murderer, and fascist Gabino Cué Monteagudo (which has been called the “government of change”), showing again the repressive policies guiding the repressive forces of the state and capital, in coordination with the murderer and oppressor of Atenco, Enrique Peña Nieto, not caring that all kinds of people had been participants in the demonstration, from children, elderly, even mothers. This is the change that we have received during the three years of his government, though his actions follow the same repressive policies of the tyrant Ulises Ruiz, without forgetting Peña Nieto who now sitting in the presidential chair continues his dirty, repressive and murderous policies. Today, as yesterday, we remain oppressed, just like the compañeros in Guerrero, Michoacán, DF and other geographic locations and resistance groups. This aggression was carried out while we participated in the May Day march, sincerely and honestly protesting against the structural reforms driven by the capitalist state and neoliberal policies. Some compañeros were attacked by paramilitaries who kidnapped other youth with a red Tsuru with license plates TKR 5739. Along with the physical and psychological attacks, our compañeros were also sexually assaulted. There are photos and videos of our compañeras being stripped as they were being detained, without knowing what awaited them ahead. We are also aware of two compañeros wounded by bullets that were fired during the demonstrations. And of others who were beaten and others who remain missing. 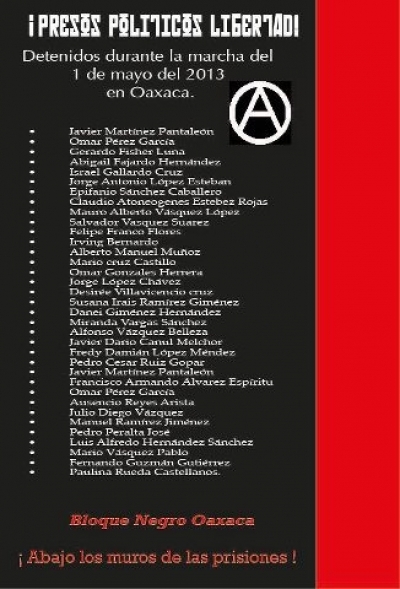 In the face of these repressive acts, we demand the immediate release of all our compañeros, holding responsable the commander, facist and repressor Gabino Cué Monteagudo, the State Attorney General Manuel de Jesús López López, the Public Security Secretary Marco Tulio López Escamilla, the head of the police operation, Commander M. Aguirre, and all those officers who participated in these brutal attacks. FREEDOM FOR ALL POLITICAL PRISONERS!! MAY MEMORY BURY THOSE WHO CONDEMN THE RESISTANCE!! IN THE RESISTANCE, OUR RESPONSE IS NOT VIOLENCE, IT IS SELF DEFENSE! !